The defenders of the Last City are back. 3 years after the release of the first game, will the franchise finally come to pc? When Destiny came out in 2014, people had high expectations from Bungie. An epic open world sci-fi adventure in with multiplayer features. What we got was a looter-shooter with a lacking story, not enough content and a partially disappointed fanbase. It was like borderlands just without the humor. On the other hand, the visuals were beautiful, the world was mysterious and interesting with cool guns and bosses, and as time progressed they updated the game with content so it became a good looking co-op shooter with a unique sci-fi world. So what's new in Destiny 2? Prepare for more epic boss fights. With the announcement trailer out for a few days now, long-time fans of the game already started speculating about the sequel. The first thing that players first noticed is that the city lies in ruins, the Traveller dotted with strange lights. As Cayde says in the trailer, the tower got destroyed under the orders of Ghaul, who will probably be a new raid boss. Also, Shaxx still lives so that's good news to some. While we don't know anything about the gameplay yet, Bungie is going to release gameplay footage on May 18th. Will it be available for PC? The last bastion of humanity is in ruins. The first Destiny came out on consoles, but even years after its release there were rumors of a possible PC release. Even the developers were talking about it. 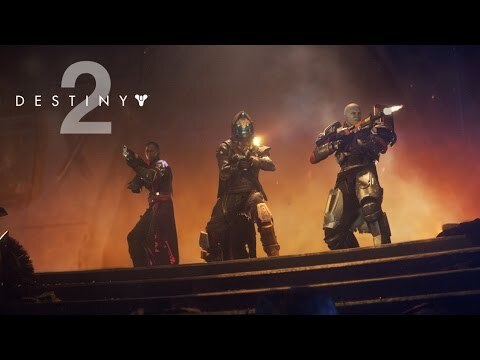 Now three years later with a sequel coming out, the chances of that happening are slim, but to the joy of many gamers, on the official Website of Destiny 2, it has been confirmed that yes indeed it is coming out on PC as well as consoles. The details are still far and few between but what we know is that it is now possible to pre-order, and it will release on September 8th, and from leaks the name of the first two DLCs that they are going to release are Eye of Osiris, and Rasputin. Zavala in his beautiful blue form. Bungie’s new shooter is no doubt going to blow minds if they manage to build on the solid foundation of the first game. Hello there, I have been a passionate gamer ever since I set eyes on my first game, I always wanted to share my opinions and infinite wisdom with the world.